Ready to take on your next paint project? Start with the newly updated ColourSmart by BEHR™ Mobile - a convenient, easy to use tool to help you find your perfect BEHR® colour, discover new designer-coordinated colour combinations, and preview your colour choices in room scenes and on exteriors. 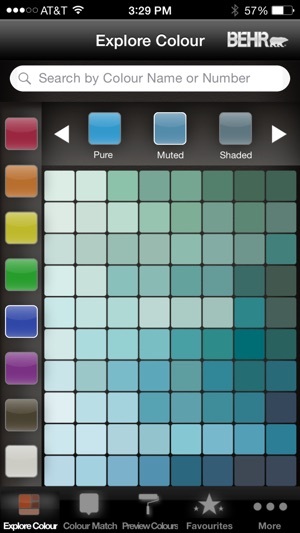 This new app has been customized specifically for the Canadian market, including unique colour collections and integration with Canadian Home Depot® locations. 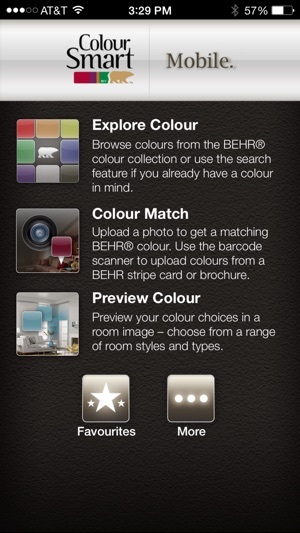 You can now access colours by scanning the barcode on the back of a BEHR colour swatch or brochure. – a quick, simple way to validate your color selections. Visit a BEHR Colour Solution Centre at your local Home Depot® to pick up your paint colour chips to get started. •Easily browse or search Behr’s extensive library of over 2500 colours including BEHR MARQUEE™, PREMIUM PLUS ULTRA® and PREMIUM PLUS® colour collections. •Use the Colour Match feature to take a photo, then tap on the image to get the closest matching BEHR colour. •Preview your colour choices by selecting from a gallery of room images and styles – simply select a colour and then tap on wall, trim or ceiling to visualize your colour combinations before you paint. •Save your favourite colours, room images, palettes, calculations and store locations to your iOS device — it’s there when you need it. •Share your colour projects with friends and family on your favourite social networks. 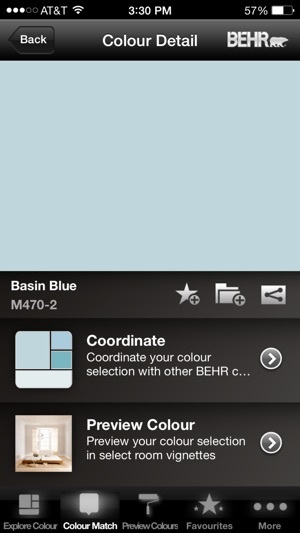 The colours that appear within the ColourSmart by BEHR Mobile App may not match BEHR colour standards. The way colours are represented on your screen can be impacted by variances in the screen display among mobile devices and the ambient light from your environment. For the most accurate representation of Behr's colours, please refer to colour cards and brochures available at The Home Depot®. 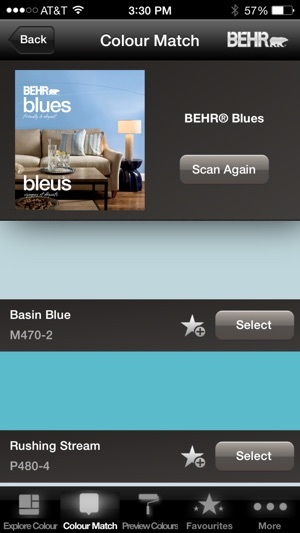 Paint colours within the ColourSmart by BEHR Mobile App are only available for Canada. In this version, we fixed a few issues around saving projects and updated Facebook services for sharing colours and projects. 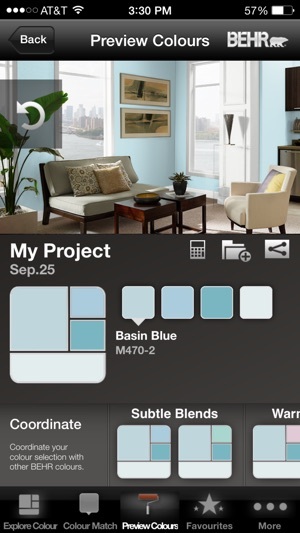 I had the previous Behr app where you could take a picture of your project and tap for the paint colour that you would like to see in your room. This app doesn’t offer that (that I can find) so it doesn’t work for me.